Adults who work in an office at a desk job spend equal, if not more, amounts of time there as they do sleeping. Those hours really add up and sitting for long periods of time can take its toll on the human body. Many offices and working professionals are adapting to the trend of standing desks to increase productivity and their employees’ health. A while back, after moving our one2love office completely over to standing desks, we wrote this post covering some of the pros and cons of the standing desk alternative to a day seated behind our PC’s. An essential component of standing at work is movement, not necessarily static standing. It’s healthy to continually change positions and even make short trips around the room every so often to get your blood flow moving. However, you don’t have to stand for all 8 hours of your workday. 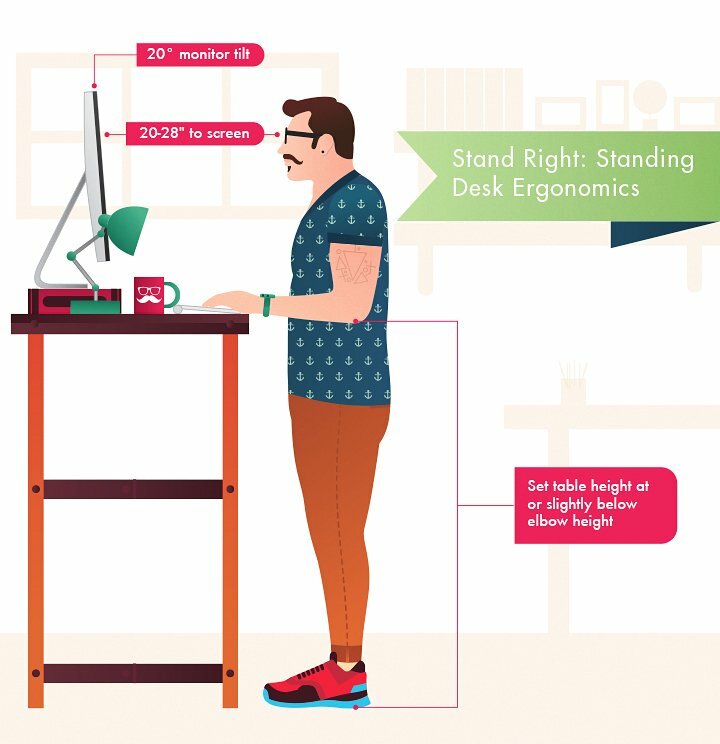 A combination of sitting and standing tends to be the most achievable and realistic change for most of us, so find a desk that can transition between sitting and standing, to keep you comfortable throughout the day. Some desks have an electric motor, hydraulic lever or manual crank to adjust the height, so think about what will be easiest or most comfortable for you. If you are particularly tall, you will want to ensure that your desk can adjust to comfortably fit your height and a variety of body types. Reviews.com looked for models that could reach at least 48 inches, with a 20-inch sit-to-stand range, which is ergonomically suitable for people up to about 6 feet 7 inches. At the end of the day, the best standing desk for your needs will come down to personal preference and each individual’s budget. Only you can decide what’s best for your needs. Hopefully, this information can help along the way.